bl.uk > Online Gallery Home	> Online exhibitions	> Asia, Pacific and Africa Collections	> Bunderpoonch, the Jumnootri Peak. 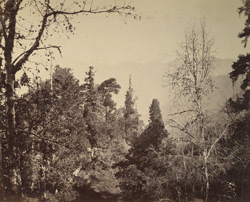 View of the Bunderpunch in Yamunotri in the Himalayas, taken by Samuel Bourne in the 1860s. Bunderpoonch peak was named after the legend that Hanuman, the Monkey God, after setting the city of Lanka on fire with his burning tail, extinguished the flame on his tail here, hence the name Bunderpunch (monkey tail). Yamunotri is the source of the Yamuna river which emerges from a frozen lake of ice and glaciers on the Kalinda Parvat at an altitude of 4421 meters. Yamunotri is one of the Char Dhams (Four Holy Shrines) along with Badrinath, Kedarnath, Gangotri and the first stop in the Yatra (Religious Pilgrimage). Considered one of the most significant journeys for Hindus, pilgrims undertake an arduous trek to the Yamunotri Temple in search of the divine. This is a view of a wooded hill top.